I was watching 'Winnie the Pooh's Adventures' the other day, I know how adult of me, and I got really inspired by it. 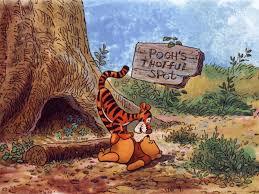 Winnie the Pooh quotes are actually really inspirational but I saw in the show that Pooh goes to his 'Thotful Spot' when he needs to think deeply about something and be alone about it. This gave me an idea to do my own 'Thoughtful Spot' blog posts, where I just talk about anything I'm thinking about and whatever goes through my mind, kind of like some sort of diary. It's probably just a way for me to vent a little and let ideas come out. Lets just see how it goes anyway. I finished school for good about a week ago and I'm not sure about how I feel about this change yet. I feel all these new responsibilities all at once and I don't know where to start with my life. It feels like my life has only really started now and I'm lost in what to do with it. It's like all of a sudden I just have all these adult responsibilities I have to do and I'm in no way prepared for them. I'm going to have to make major decisions about my life soon and I'm confused about what to do. I've got this huge blank canvas of a life and it's scary to think I'm the only person in charge of what the picture turns out like for the first time in my life. It's a huge time in my life and probably the most important in deciding where the rest of my life goes, which is terrifying. I get to spend the next while deciding on these important things and so do all my friends which means everything is constantly changing, and for someone who is a routine kind of person, I'm not sure what's going on lately. It's scary to think so many people my age and my friends are all trying to find their way in the world and find themselves. It's crazy to think I've no idea where I'm going to be in the next few years or even next month. Change is something I'm not used to at all. I've been stuck in the same routine for basically all my life and it's strange to start a new one that probably won't be so routine ever again. It's like I've lost my comfort zone and have to try and find one again. I know not all change is bad and I know this one isn't. I'm ready to try new things and move on in my life but it's going to be so weird to adjust to everything around me that is going to be constantly changing all the time. I'm excited and nervous and just every emotion really. Anyone understand this feeling or is afraid of change?